"Do you know what he looks like?” I’m asked. “Yes. No. Well, I did.” I reply. Looking up to the popular and part-packed Paddock Hill bank I’m pointed towards a man standing alone in the bank holiday sunshine, arms crossed beneath a jumper slung over his now-wider shoulders. There’s no swarm of selfie-hunters; he’s indistinguishable but for the Grand Prix Drivers Club cap in his hand – a cap he proudly prods, shuffles around and holds throughout our impromptu hour together. 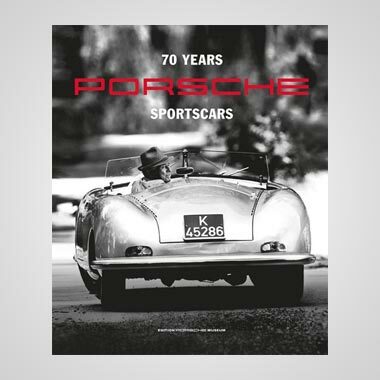 Kurt Ahrens is not necessarily a name that trips off the tongue of die-hard motor sport aficionados, but the 76-year-old competed in one of the most famous sports cars of all time and witnessed racing history in the making. 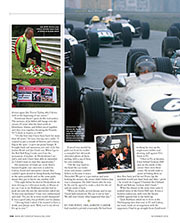 Almost 50 years after walking away from the sport to pursue a conventional life, Ahrens is at Brands Hatch to help begin Formula Junior’s diamond jubilee world tour with Howden Ganley, Sir John Whitmore and others at the new ‘Legends of Brands Hatch’ Superprix. Emotional doesn’t quite do the visit justice. 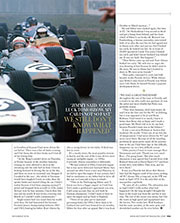 The memory of Jo Siffert still hangs over the circuit, 45 years after his fatal crash at Hawthorn. 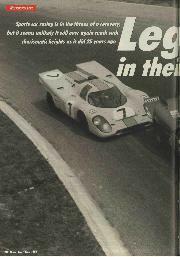 Ahrens and Siffert raced together and they won together, breaking the Porsche 917’s duck in Austria in 1969. His memories of Clark are vivid. Kurt’s limited English (our interview is aided by Carlos, friend and interpreter) meant they couldn’t quite stretch to being friends, but being in the same paddock and on the same grids meant they got to know one another well. 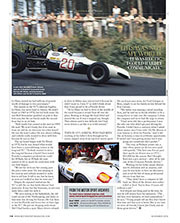 “The night before he died at Hockenheim we were driving to a television studio in Mainz in my car. I sat in my Brabham and Jim had to push me onto the set; the interviewer asked me: ‘Is this your mechanic?’ I was very embarrassed and said: ‘No, no, he is twice world champion!’ It was a good joke, but probably not for Jimmy. If proof was needed he pulls out from his wallet a crumpled but obviously cherished photo of them smiling with a jug of beer, his eyes reddening. “On the way back to the hotel the car broke down and Jimmy couldn’t believe it, because it was a Mercedes! We got to a gas station and were looking for money; the owner didn’t believe Jim was a champion. He didn’t know who he was. In the end he agreed to make a deal for the oil and we made it back. By this point, 1968, Ahrens’ career had reached a pivotal crossroads. He had been working his way up the single-seater ladder and showing well against F1’s finest in F2. When his chance in the main class came it washed away in the Green Hell rain. It was a luckless endeavour, with even the Sussex wildlife against him in the build-up. “Jack Brabham asked me to drive at the Nürburgring later that year in F1 and Caltex, my team, made an arrangement with the organisers. I had to go straight from Zandvoort to Goodwood because I had never driven the car before. There was a line of ducks crossing and I hit them; the oil lines broke and I lost all of my testing time. Single-seaters had very much been his world until then. He had dominated the German Formula Junior championship between 1961 and 1963, beating his father (Kurt Ahrens Sr, also a racing driver) to two titles. A third was lost in court. 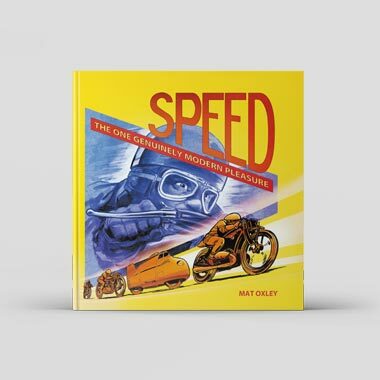 It’s a murky story; the most popular version is that he and the rest of the Lotus drivers were racing an ineligible engine – a 1500cc Cosworth. Ahrens remembers it differently. “We had ordered a1500cc Cosworth engine but it was never delivered. Gerhard Mitter then accused me after I won a race near Hanover, so we had to open the engine. It was correct, but I had no mechanics so my father had to drive all the way to Cosworth to have it rebuilt. I will come second, then we will both be German champions.’ I didn’t want to have to open the engine and go back to England. Their paths continued to cross and both became works Porsche drivers. While Ahrens says Mitter’s only friend at Porsche was fellow racer Udo Shütz, he himself became a popular development driver. 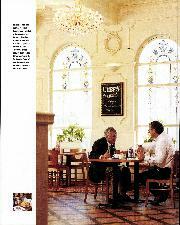 “We had a great friendship throughout the rest of the team at Porsche and a rivalry to see who really was quickest. Jo was the safest and most reliable but Pedro was probably fastest. It was a rare terse Redman in Austria that weekend. 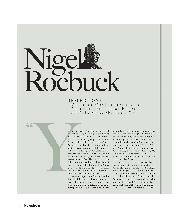 He recalls: “I had one of my few fits of temperament. 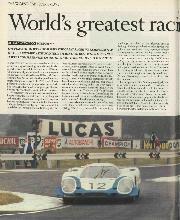 I had never driven the 917 and never raced there. Because of all the handling problems Jo spent pretty much all the practice time in the car. I had three laps in this difficult, dangerous car on a fast, difficult circuit. It was as a Porsche test driver that Ahrens later had the biggest crash of his career, writing off 917 chassis 006, a long-tail, at the VW test track in April 1970. It is the only blot on his near-perfect copybook. 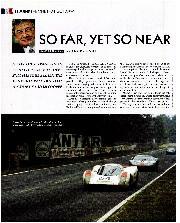 Due mainly to the 917’s inherent fragility, Le Mans was never kind to Ahrens. He didn’t finish in 1969 or 1970, but led both times. He and Rolf Stommelen qualified on pole in that first year, but the car barely made the second hour due to an oil leak. The car lasted longer with Vic Elford in 1970, but he was denied what would have been a career-defining victory in the long-tail 917. “Nobody wanted to drive the long-tail because it hadn’t been tested. 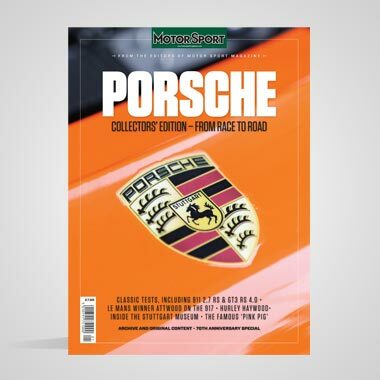 Porsche’s computers predicted we could hit 405kph, but at 385kph the nose started to lift so much we could steer with our little fingers. 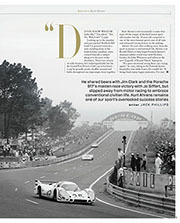 Despite the repeated misfortune the 917 is still the car that holds Ahrens’ best memories. It was fast but fearsome, so not even Jacky Ickx could live with it. “We were testing at the Südschleife, the old south circuit of the Nürburgring, and Jacky at that time was driving for Ferrari. 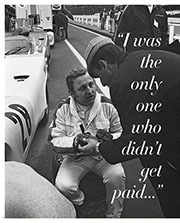 He was there to test for Porsche and drove two or three laps in the 917. He got out dripping with sweat. Me? I had barely a spot. Many drivers refused to drive it; Mitter once over-revved it because he didn’t want to. I was 27 so didn’t think about that. I was proud to be a Porsche driver. Then in 1971 Ahrens, who had been working at his father’s firm throughout his career, slipped away from top-level motor sport. He raced just once more, for Ford Cologne in Brno, simply to see his family-in-law behind the Iron Curtain. “My father was running a metal recycling firm, and he told me to decide whether to be a racing driver or take over the company. I chose the company and never had the urge to return. Working for his father meant Ahrens was by definition still an amateur, and says he was lucky to have an alternative and avoid the fate of many professional drivers from that era.